Xiamen Air (Xiamen Airlines) (Xiamen, Fujian Province, China) launched the first ever intercontinental route between Fuzhou and a destination outside of Asia with the opening of a regularly scheduled nonstop flight between Fuzhou and Sydney on November 29, 2015. The airline will also initiate nonstop service between Xiamen and Sydney starting on December 5. Xiamen Air launched nonstop service between Xiamen and Amsterdam in July 2015, marking the opening of the airline’s first intercontinental route. 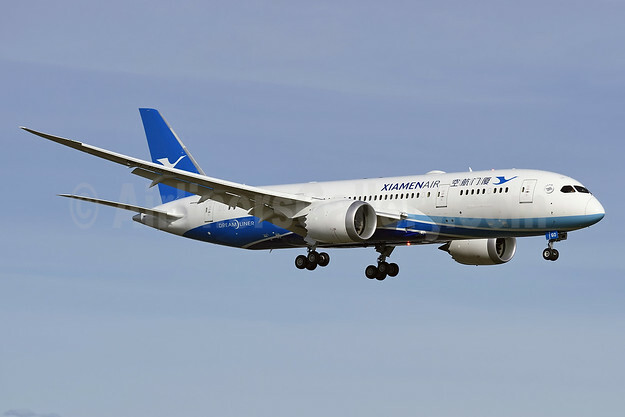 The new services to Sydney, operated by Boeing 787-8 aircraft, will help Xiamen Airlines expand its network. The new Xiamen route reduces travel time between the city and Australia to nine hours. Xiamen Air plans to continue expanding its overseas network while its fleet of Boeing 787-8 aircraft will service international routes. The airline plans to add the more advanced Boeing 787-9 aircraft to the fleet in a move to further expand its global network. The Chinese airline plans to launch nonstop service to Melbourne, Vancouver and New York in 2016. Top Copyright Photo: Steve Bailey/AirlinersGallery.com. Xiamen Air Boeing 787-8 Dreamliner B-2760 (msn 41540) arrives at Paine Field. This entry was posted in Xiamen Air and tagged 41540, 787, 787-8, B-2760, Boeing, Boeing 787, Boeing 787-8, Dreamliner, Fuzhou, Sydney, Xiamen, Xiamen Air on November 30, 2015 by Bruce Drum.